This garden was started by members of the Zandvlei Trust in 1999. It is situated on Main Road, Lakeside in Cape Town (opposite the Lakeside Shopping) and adjoins the Greater Zandvlei Estuary Nature Reserve. The original idea was to draw attention to the Wetlands and Zandvlei in particular. Often passing motorists do not realise that there is a large water body on the other side of the railway line, which provides a variety of amenities for recreation. 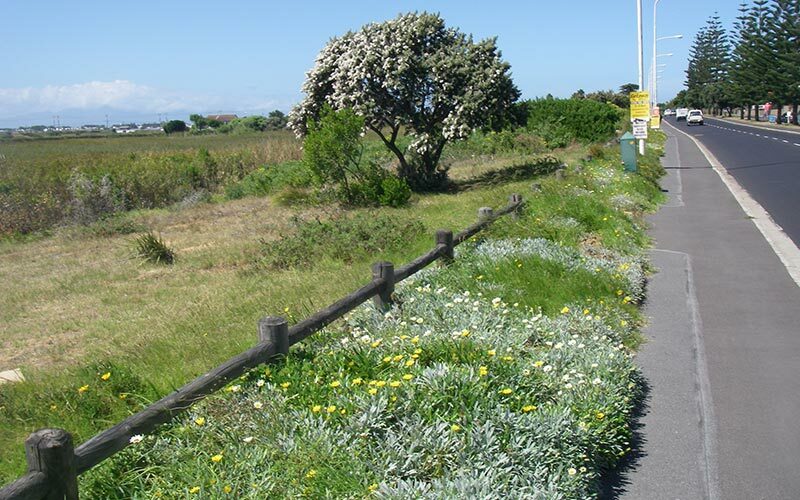 The garden is the result of a working partnership with the City of Cape Town, local businesses and the Zandvlei Trust. The aim of this project is to create an attractive indigenous garden, free from invasive plants and litter. It now also provides an attractive window to the edge of the Westlake Wetlands. The recycling bins are across the road from the garden area and the gardener employed by the Trust is able to service the recycling bins on a regular basis as part of his duties. Noel Kuiler has tended the garden and the bins since 2011.